I like to keep my kitchen stocked with fruits that I’ve preserved myself. It’s so nice to be able to purchase them in season and stock up when they are on sale and tuck them away for those long winter months, when the out of season fruit can be so bland. I do a combination of canning, drying, and freezing of fruit. Apples are coming into season soon and if you find a good sale on them you’ll want to stock up. Did you know you could freeze apples? Here’s how to freeze them. Apples from the freezer are good for pies, crisps, smoothies, and applesauce. Pretty much any cooked recipe these frozen apples will work in. 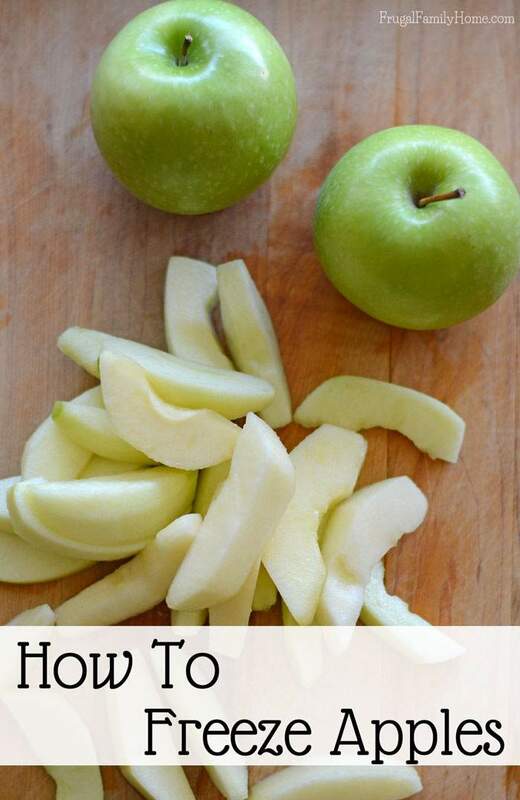 By following this method, your apples can look really great too. They won’t turn brown in the freezer. I discovered how to keep them from turning brown one day when I ran out of fruit fresh. I was working on canning peaches. When canning peaches you use a mixture of water and fruit fresh to keep the peaches from browning while you are preparing the rest of the batch. Half way through canning the peaches, I discovered I had run out of fruit fresh. When I needed to make another batch of fruit fresh soak. I knew there had to be another way to keep the peaches from browning. I looked through my pressure canner book and right in the book was a super inexpensive way to keep the fruit from browning. It was salt water. Yes, just salt water will keep the fruit from turning brown. It’s cheap to make and works just as well as the fruit fresh. And it doesn’t make the fruit taste salty at all. The salt water just keeps the fruit from turning brown. It works great with all kinds of fruit. The salt water works great for keeping the apples from turning brown too. Here’s how I mix it up. I place 8 cups of water in one of my big bowls. 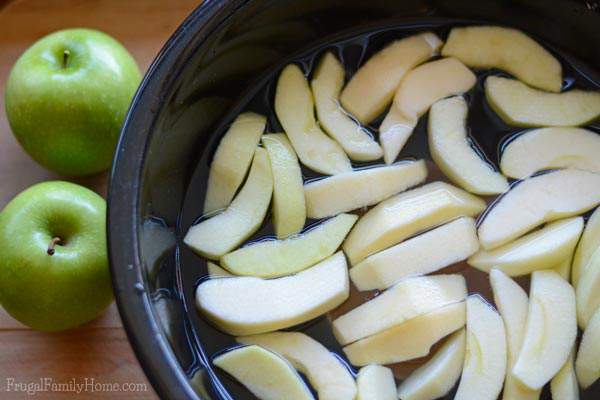 Make sure the water is not much over 2/3 full since you need room to add the apples to it. If the bowl is too full you won’t be able to add too many apples. To the 8 cups of water, I stir in 2 tablespoons of salt and stir to dissolve. 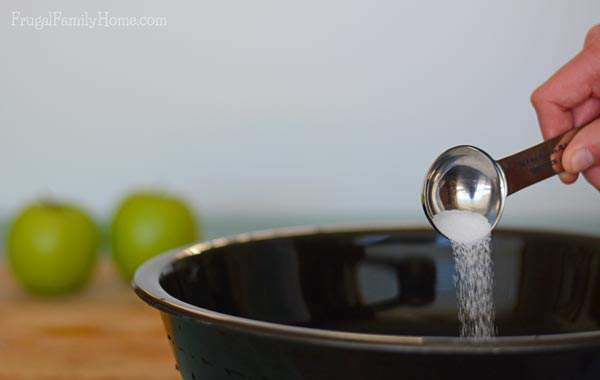 This mixture will keep the apples from browning while you are preparing all of them for the freezer and it will keep them from turning brown in the freezer. I love that it’s so inexpensive too, much less expensive than the fruit fresh. Make sure to submerge the apples by pressing them down. This ensures that they get the salt water on them to keep them to keep them from turning brown. Once all the apples are prepared and have soaked for a few minutes. Drain them in a colander, but don’t rinse them. Add the apples to the freezer bags and be sure to label them. I know I always think I will remember what is in the bag, but I don’t always remember. Once I thought I had peaches but it turned out to be pumpkin. So be sure to label the bag with the contents and date. 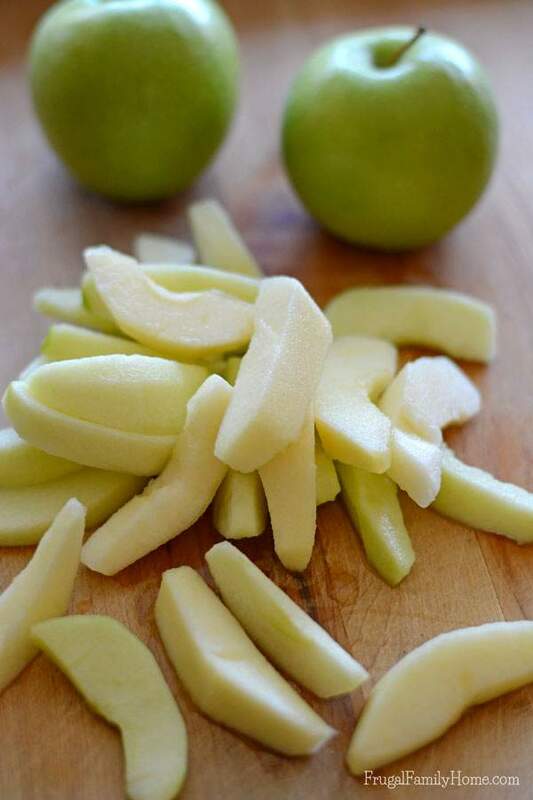 Place the prepared apples into the freezer and freeze until ready to use. If you know what recipes you’ll be using your apples in, you can prepare them for the recipe in just the right amounts. I know for my apple crumb pie, I need 4-5 apples sliced thin. If I’m preparing the apples for a pie, I’ll be sure to label the bag pie apples or something like that. It makes it so much easier to just thaw the apples and dump them in the recipe. That’s my inexpensive way to freeze apples. It doesn’t take too long to do and you can preserve those great fresh apples for your fall and winter pies, cakes, muffins, and bread. I can almost smell it all now. Have you ever tried freezing apples before? If you know someone who would love to read this post, I would love to have you share it. Just scroll down a bit and use the social buttons below. Thanks so much! 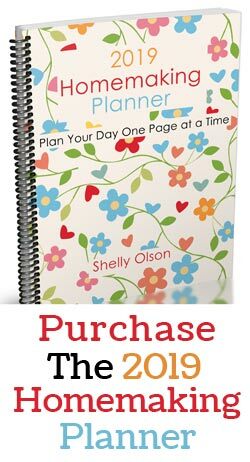 This is such a great tip, Shelly! I place peeled potatoes in cold water to keep them from turning brown, but I didn’t know that I could put apple in salt water to keep them from turning brown. The frozen apples work great in pies and other baking recipes. I don’t think they would work well for just eating as the texture will be different, but for baking they work great. I haven’t tried using honey before, thanks for sharing your tip! Hi, This blog is very informative, thank you all. We just moved to MN and I just received a box of apples. I was excited to hear that we can use honey and water to stop apples from turning brown before freezing. Curious question, I don’t have vitamin C on hand (like someone stated below that it works for apple snacks in the fridge), will honey and water work for sliced apple snacks in the fridge? Thanks again for all of your suggestions. Michelle, It looks like you can use the honey and water. Here’s a video I found from America’s Test Kitchen. I hope that helps. Another item you can use so your fruit don’t turn brown is vitamin C.
Great tip! Thanks for sharing it, Ruthann. I actually use this method for lunch apples. 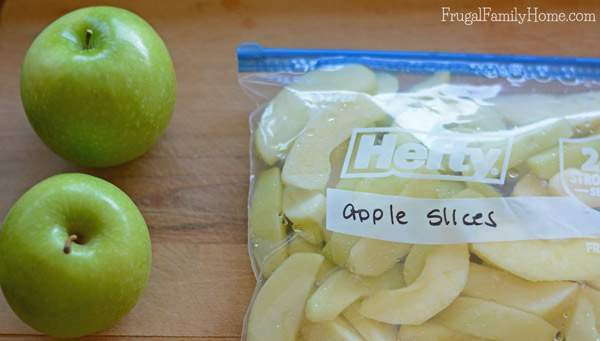 I pack several small bags of apple slices and keep them in the fridge for the weeks lunches. Keeps fresh for several days! That’s a great tip, Lorry. Thanks for sharing! I’ve always used salt water because that’s the way I learned from my Mom. Or sometimes just lemon juice, too. I’ve always used lemon juice, but I’ll use salt water next time, thanks for the tip. Lynn, you are welcome. It must be wonderful to be able to get apples so often from your apple tree. I would love that! Thank you so much for this wonderful tip! I’ll have to share this with my friends! I am definitely going to do this. I have a Golden Delicious apple tree with so many apples, I didn’t know what to do with all of them. Freezing them is something I never thought of! Thanks for the great idea! So helpful! Going to do this today after I get back from the orchard. Couple questions…after you drain the apple slices, are you patting them dry at all or just right into the freezer bag? Do you just thaw overnight in fridge before use? For recipes that call for diced apples would you dice before freezing or after thawing when you’re about to make the recipe? I’m so glad this was helpful for you. I hope I’m not too late in answering your questions. I found your article vary helpful and did as you said and now have a freezer full of yummy apple slices freezing in the freezer. This will be great to bring out for the holiday’s. I can’t wait! That tip worked great too. I was going to put off freezing till I purchase fruit fresh then I read your tip. Thanks, worked great. I’m so happy I found this. Here in Massachusetts we have a short apple crop due to the warmth we had causing everything to bloom early then a hard frost killed alot of the blossoms.I live behind an orchard so I went apple picking w My 2 yr old and bought the biggest bag they sell, knowing I prob wouldn’t go picking again. Now I sit and think of what to do w all of it. So good to know you can freeze them! Thankful to come across your blog on pintrest as well!! I’m glad to know it was helpful. Thanks for stopping by Christine! This works great. Have been doing this with all my apples. I lay them indiviually on cookie sheets first. You can also do this with pears. Lisa, We are almost neighbors then, I’m in Oregon. 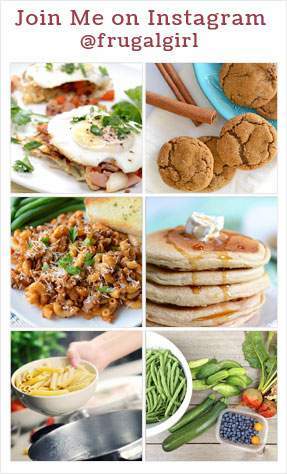 Pinterest is great for finding all kinds of useful information. Thanks for stopping by! Thank you so much for this advice! Do you know how long they can be frozen for? Thanks! They should be good for about 6 months in the freezer. Thanks for asking Danielle. I’m in the UK, need to make more of my freezer and this apple freezing is just fantastic, brilliant! Gald you found it helpful, Doreen. I have been doing the salt solutions for years. Also works when using them right away. Thanks for sharing that tip, Peggy. Do you still have to use the fruit fresh or salt water if you peel just so many and use a food sealer? Shawn, They might turn a brown in color if you don’t use Fruit Fresh or the salt water but if you don’t mind that then you could skip that step. Thank you for these suggestions. I grew up on a commercial apple farm and it’s been in our family for 4 generations. I usually cut my apples up, put them into a lemon/water mix. I then mix the amount for an apple pie with all my seasonings, put that into a freezer bag, but shape it in a 9″ aluminium pie pan, then put it into the freezer. When I bake pies I take out the frozen apple mixture and pop it into my pastry (mine or store bought) in a 9″ pie pan. Usually the mixture defrosts enough by the time the tops are put on. Bake as usual. I can make dozens of prepared apples but only bake pies as I want. Got to go. Several bushels of apple are calling for me. Thanks for sharing how you make pies for the freezer. Kerrie, I would say 10-12 months in the freezer. I hope that helps. Do I have to peel the apples? Christina, I’m not sure how the apple peels would do after freezing, I always take them off. But if the apples were thin skinned I think they would do ok. I’ve never tried freezing the apples with the skins on. Sorry I couldn’t be of more help. Does anyone know if the nutritional value changes much after being frozen? I’m going to dice apples and freeze them to use later on for lovebird treats, and because lovebirds are so tiny, the amount of nutrition needs to be carefully maintained. Because of this, I’ll be using the honey method, since even small amounts of salt can really mess with a lovebird’s hydration and hormone levels. Just an fyi for any fellow lovebirdies out there; if you carve jack-o’-lanterns for Halloween, or even if you buy pumpkins for fall decor, your lovie will love to munch on it! There’s tons of vitamins that aren’t always completely present in regular seed food. I just take the scrapings and dice it up, then freeze it by putting it into ice cube trays, then bagging it up. I do it that way because the pumpkin starts to ferment almost as soon as it thaws, and since it’s preportioned, I keep just one thawed cube in a Ziploc baggie in my fridge. Grey Aria, I’m not sure. I know most vegetables and fruit when frozen maintain most of the nutritional value, much better than canning but I’m not sure how much is lost if any. I did a quick search but didn’t find any specifics. Sounds like your birds eat very well. Hi Aria, I peel, slice or dice , place in a large frying pan and add 2 or 3 tablespoons of butter . I cover them and steam them for about 10 minutes while I get the next batch of apples peeled and sliced. I cool the apples, place in freezer bags and flatten the bags . I have used these up to 2 years later and the apples taste just as good as the first ones I used. And the apples don’t turn brown.